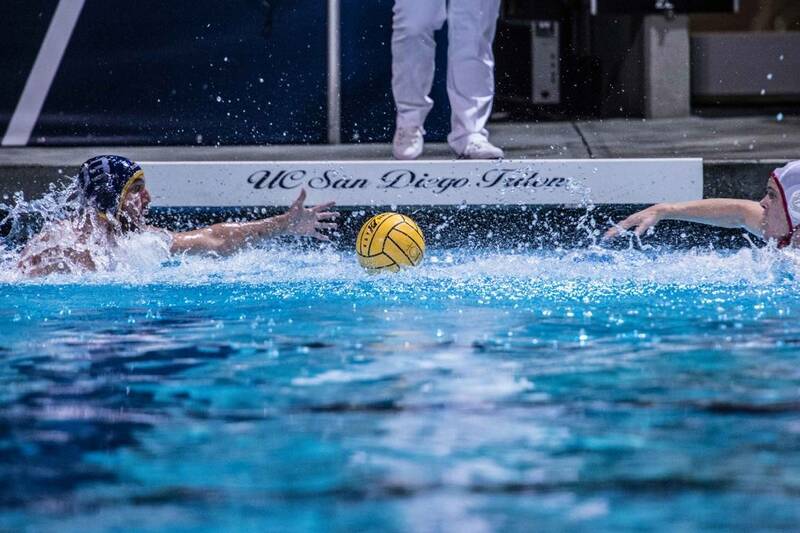 When the Tritons discovered in the offseason that they would be hosting the 2014 National Collegiate Water Polo Championship this winter at Canyonview Pool, the prospects of making it there themselves must have seemed daunting. The UCSD men’s water polo team had come off of a 14–14 season, ending its 2013 campaign in a bitter 6–5 loss against St. Francis University that barred it from entering the NCAA Finals. When this season rolled around, things looked even tougher, as the Tritons started off 3–6 after several losses against the nation’s top teams. Making it to the NCAA Final Four appeared an incredibly challenging task, especially for a Division-II group going up against the country’s best Division-I squads. Yet, fast-forward a couple of months and here they are, the No. 6 blue and gold hosting the top three colleges in water polo to battle for the national crown. The Tritons cruised to their 17th Western Water Polo Association conference title before defeating No. 9 Brown University 12–7 in last Saturday’s NCAAs play-in game. Next up, fourth-seeded UCSD will face top-seeded No. 2 UCLA in the semifinals of the national tournament this Saturday. After an impressive season, the 16–9 overall Tritons have battled their way to compete in the Final Four tournament that they will host this coming weekend. UCSD is led by longstanding head coach Denny Harper, who recently earned his 600th win in his 34th season as the Tritons’ head water polo coach. In the pool, a formidable senior class has paved the team’s way to nationals. After redshirting in the 2013 season, senior utility Josh Stiling — who leads the team with 67 goals and 44 steals and recently earned his second straight WWPA Player of the Year award — and senior utility Lukas Syka (31 goals, 20 steals) returned this year with stellar play. Senior utility David Higginson (28 goals, 25 assists, 35 steals) and senior two-meter Matt Michalko (30 goals, 26 steals), among others, have also proved crucial in this year’s run. Senior goalkeeper Cameron Ravanbach has served as a consistently steadfast presence in the cage with 290 saves, nine assists and 32 steals. While the Tritons have been riding high on a four-game winning streak, the UCLA Bruins will be as tough an opponent as one can find in collegiate waters. The Bruins are 27–3 on the season, with their three losses coming in close outcomes only against No. 1 Stanford University, No. 3 University of Southern California and No. 4 California State University, Long Beach. While they have no singularly dominant player, they have the depth of an undoubtedly elite squad. Of their 21-man roster, 19 players have tallied goals in the double-digits, and they have outscored their opponents by a near 3-to-1 margin on the season. In their two meetings this season, the Bruins had little trouble handling UCSD in 13–5 and 17–5 blowout victories. If the Tritons are to prevent history from repeating itself, they will need to put up their best performance of the year on both ends of the pool. UCSD’s semifinal match will take place at 1 p.m. on Saturday, Dec. 6, while the other semifinal match between second-seeded No. 1 Stanford and third-seeded No. 4 USC will follow at 3:10 p.m. The winners of both matches will meet for the championship game at 3:10 p.m. on Sunday, while the third-place game will occur earlier at 1 p.m.